It’s funny how things work out. As a bit of an introvert (if you are interested, you can read more about being an introvert in a post I wrote for ShropGeek here) I have a real love / hate relationship with public speaking. I love the feeling I get when I’m actually doing the talk and the audience is responding well (even if its only laughing at the animated .gifs which I can’t take any credit for creating) and the huge sense of achievement I always get afterwards. But, I really don’t like the build up at all. I find it very stressful. To the point that in December I had said that I wouldn’t do much public speaking in 2015. And then less than 12 hours after uttering those immortal words I had an email from Dave Redfern… He had seen my talk at Responsive Day Out in Brighton last year (you can read more about that here) and wanted to know if I would present the same talk at January’s Staffs Web Meetup. Of course I said yes. And I’m so glad I did. 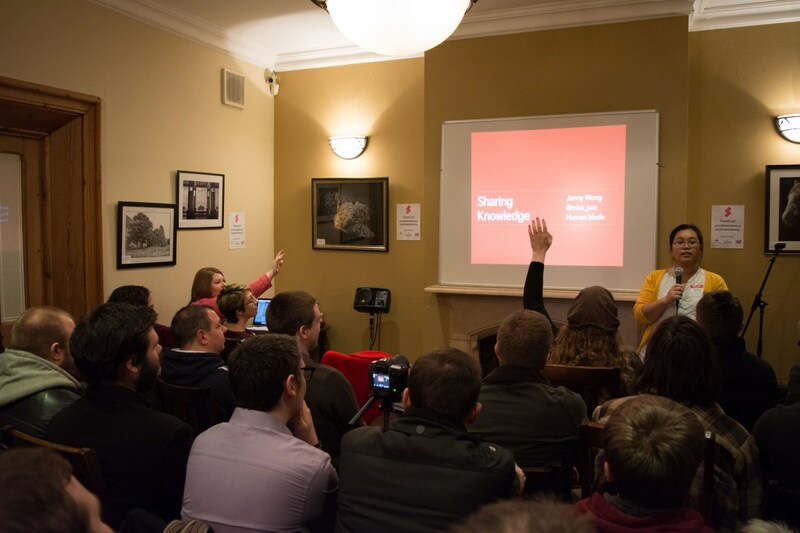 I am a huge supporter of grass roots events, I literally cannot put into words how important I think they are, not just for developing and diversifying the web community, but also for inspiring us and pushing us all to do awesome work. And Staffs Web Meetup is one of the best I’ve been to! The lineup on the night was myself and Jenny Wong. Jenny did a really inspiring talk encouraging people to get involved with events and start public speaking. Its something I champion a lot through ShropGeek and she made lots of excellent points. For the record: I do not live in a pink house, or own a pink dressing gown/sofa or have that many cats. Honestly! ~ grin! The whole evening was a huge success, it was really well organised, there was a great crowd of people there, the venue was fantastic, and the food laid on looked amazing (I can never eat before doing a talk so sadly didn’t actually try any). Staffs Web Meetup is held on the Third Thursday of each month and highly recommend that if you are anywhere near the area you go along. I will certainly be going back again very soon! More photos can be found on their website here: http://staffswebmeetup.co.uk/ and you can follow them on Twitter here: @StaffsWebMeetup. You can never go wrong with mini burgers! Thanks for your kind words Kirsty. Thanks for speaking! we had lots of positive comments about your talk afterwards. Sorry the trains were such a nightmare that night! Me and Phil are planning to pop down to shropgeek at some point soon. Hope your unconference goes well! Sorry I can’t make it this time.